I got yall DESPERATE for some water! You been burnin this whole time! Funny how truth will do that. Now you circle jerk eachother trying to make each one feel a bit better because you cant handle the Truth. Nesta1 says 40% of Black Americans are "just plain stupid" and Jahcub support that too..
For them soft! Yes, them soft! Them soft! Yes, them soft! To destroy the human race. Reggae music, chant down Babylon!" Suckin' the blood of the sufferers, yeah! Building church and university, yeah! Deceiving the people continually, yeah! Look out now they suckin' the blood of the sufferers"
***That's who fills the proud halls of the institutions of Babylon's governance in Washington DC -THIEVES AND MURDERERS. You have fallen to 'the most effectively organized programmed of deceptive propaganda' that Haile Selassie speaks of.. Sad. The babylon system loves every word you have said about Trump and America. You willfully side with the establishment media and actuall nazi George Soros. 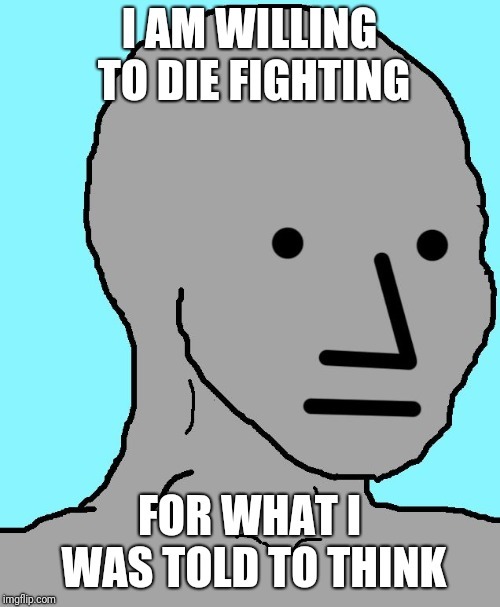 Sounds about right for someone who says 40% of Black Americans are "just plain stupid"
The NPC's wont give up!! You're right. i should have followed your advice more closely. I feel bad... i broke him - he's stuck in a loop. You literally took 'the loop' from me Nesta.. C'mon now.. A little more creativity here.. Plus I told you that im going to follow you on this forum to let everyone know what you think about Black Trump supporters.. Dont go patting yourself on the back like you did something here.. Especially when you use what I was calling you days ago.. Thats just inauthentic..
'You broke me' lol.. Seems pretty desperate to me. In the LORD I take refuge. How then can you say to me: �Flee like a bird to your mountain. For look, the wicked bend their bows; they set their arrows against the strings to shoot from the shadows at the upright in heart. When the foundations are being destroyed, what can the righteous do?� The LORD is in his holy temple; the LORD is on his heavenly throne. He observes everyone on earth; his eyes examine them. The LORD examines the righteous, but the wicked, those who love violence, he hates with a passion. On the wicked he will rain fiery coals and burning sulfur; a scorching wind will be their lot. For the LORD is righteous, he loves justice; the upright will see his face.